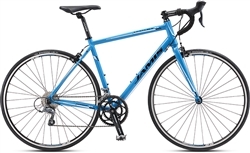 Browse our huge selection of Jamis bikes below! This renowned American manufacturer was the originator of the Earth Cruiser, a popular beach cruiser bike, in 1979. For over 20 years, Jamis has been creating a variety of styles and models to fit any need – from the casual cruiser to a road-tested sports bike. The winner of over 10 bicycle awards (from both Bicycling Magazine and Mountain Biking Magazine), this company has a reputation for sturdy, durable bile. Browse Jamis mountain bikes and Jamis road bikes at Colorado Ski Shop! Men's performance road bike that blends race caliber geometry with improved comfort design.